The weather is usually reliable in September; children go back to school, cricket tournaments come to a thrilling climax, autumn mists linger in the dells before the sun burns it off and it is a great time of year to go for a walk. This year, after the prolonged summer, September has been a bit of a climatic disappointment but the rain, cooler temperatures and wind did not deter us from completing the 60+ mile, four day, Cotswold Diamond Way, a circular walk starting and finishing in Moreton-in-the-Marsh. We were largely a group of a certain age, all with different reasons for wanting to do it. A number of us will be flying off to Nepal in less than three weeks to trek in Mustang, so it was useful preparation, while others just wanted the camaraderie of walking and camping with friends. Everybody arrived on the Thursday evening for a delicious paella and fruit crumble, and to reacquaint ourselves with each other, many of whom had not seen each other for some time. Friday morning dawned damp with the prospect for improvement as the day wore on. Spirits were high as we walked away from Moreton-in-the-Marsh, aiming for the northern tip of the diamond just beyond Ebrington. The improvement in the weather seemed reluctant to adhere to the forecast and it remained damp until lunchtime. A brief spell of sunshine allowed us to have lunch in some comfort before the weather turned very wet for the last hour or so. Dinner that night was a very soggy affair with the gazebos acting as reservoirs before a gust of wind deposited their load on us, the seats or anything else that got in the way. The delicious bolognese warmed us up but, needless to say, we all disappeared to our tents for some comfort and an early night. The forecast said there would be no rain on Saturday but it rained with us until about midday. Our start point at Far Upton Wold was not the quiet place it had been the evening before. All along the verges horse boxes and four wheeled drive vehicles were parked. Why? 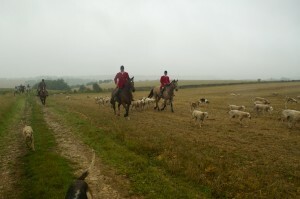 The hunt was out and we had not gone far when we met them returning. The walk entailed travelling through some lengthy stretches of long grass and it was not long before we had wet legs and, more uncomfortably, wet feet. It also entailed walking through Jackdaw’s Castle, Jonjo O’Neil’s racing stables. Security cameras monitor us entering his land, acre upon acre of manicured lawn with race tracks for training and exercising the horses. We see very little activity but, perhaps because it is Saturday, the activity is all at the race tracks around the country. Stopping for coffee at The Plough in Ford was an interesting experience of logistics. Being wet and wearing muddy boots we chose to sit outside at the picnic tables underneath a huge canopy. Eventually getting somebody to take our order for coffee or hot chocolate, we waited. One by one our drinks arrived, not in a steady flow but punctuated so that what should have been a ten or fifteen minute break extended to half an hour. The bill came very quickly upon request. 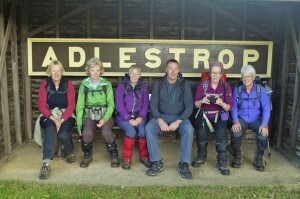 We continued through Temple Guiting, stopping for lunch in a field overlooking the Windrush Valley as the sun came out. 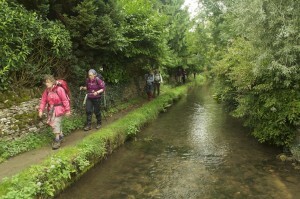 We were to follow the Windrush River for much of the rest of the day, and indeed the proceeding days walking. 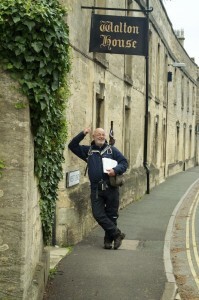 We managed to get to Guiting Power just after the pub, The Farmer’s Arms, had closed at 2.30. I didn’t think pubs closed on Saturday afternoons any more. Despite being closed we were served provided we sat in the garden. 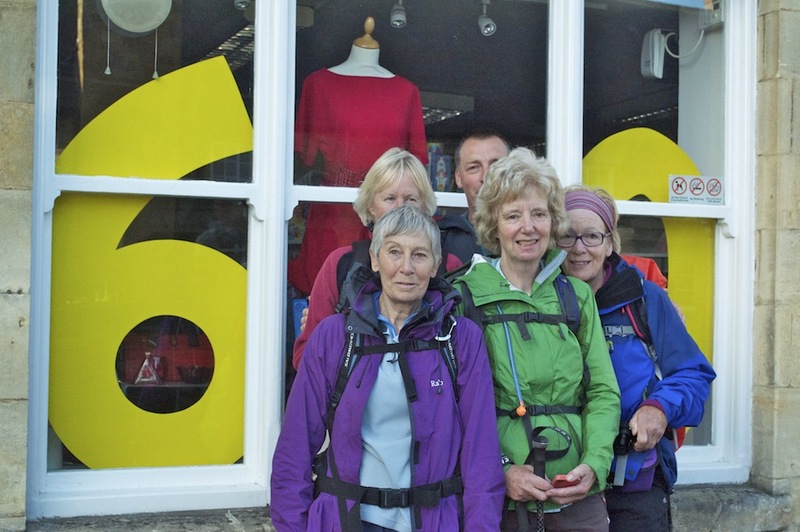 Our walk for the day concluded at Notgrove a quiet, sleepy village with llamas and alpacas watching us from a field. The villages are beautifully kept and there are some stunning properties but they seem lifeless. Most of those we passed through we saw not a sole; nobody washing their car, tending their already immaculate gardens. Most villages seemed deserted and is a sad indication that most of the houses are second homes and not often lived in. Somehow the local character has gone and we were passing through show villages reminiscent of the 1960s TV series The Prisoner with Patrick McGoohan. On Saturday evening we ate a super meal at The Halfway House in Kineton. When we arrived there were a few people in but by the time we left soon after nine we left the place deserted. The forecast for Sunday was not at all good so we decided to start earlier in order to try to finish before the worst of it arrived. We set a good pace down to the southern end of the Diamond at Northleach before heading towards Bourton-on-the-Water. Northleach, a former wool town, is a small market town with a main street of interesting buildings. The first we came across as we entered the village was the old police station, magistrates court and prison, all housed in the same building. It is now a cafe, closed because it was Sunday, but looking through the window there were picnic benches where once prisoners had exercised. Further down the main street is Walton House, a grand Cotswold stone town house now used for sheltered and retirement housing. Before the war it was a large, old coaching house but with the onset of war it was a billet for RAF pilots of No. 87 Squadron who flew Hurricanes from an airstrip between Northleach and Bibury. There is a blue plaque marking their wartime occupation. We stopped in the village square to take advantage of the facilities and for me to buy water as I had been stupid enough to forget my Sigg bottle. The countryside was beautiful without being dramatic. As we had started earlier we were able to see much more wildlife. Soon after leaving Notgrove Red kites circled overhead, their spirally route only interrupted occasionally by an anxious crow making a threatening approach. Later we saw, across a field, a red deer with a fawn, both anxious to escape our view, leaping over a fence into trees, although the fawn had some difficulty in following its mother for a while. The forecasted rain managed to hold off but the wind gathered strength as the day wore on. 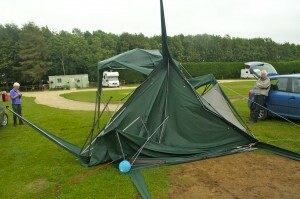 One gust hit us and I commented that that was the gazebos gone. How true that turned out to be. 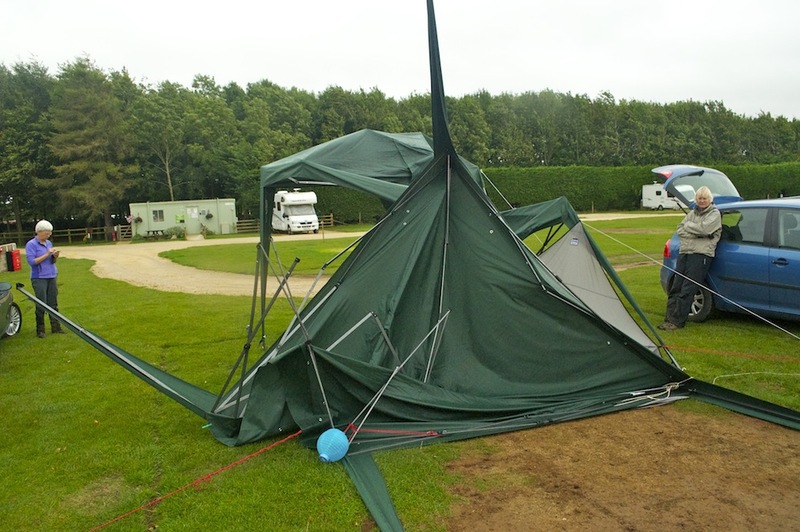 Finishing our walk in Bourton just as the first few drops of rain fell, we returned to camp and the devastation of our gazebos. The warden and his wife had done what they could to save them but it was useless against such wind in a very exposed place. Thankfully, no cars were damaged. That evening the rain hammered down and we adjourned to Stella and Richard’s in Chipping Campden for supper rather than trying to cope with very adverse weather conditions. By the time we left Chipping Campden to return to camp the skies were clearing and temperatures were dropping. The next day dawned bright and we decided to make an early start again. This was necessary because of the distance we had to travel. By our calculations the mileages in the guide book were not quite accurate. Each day should have been 15 miles but the first had been 17 and this last day was going to be close to 20 miles. This section of the walk took us through some of the prettiest villages on the diamond. I particularly like Icomb, a picture postcard village with hanging baskets adorning the beautiful Cotswold stone, particularly when illuminated by brilliant sunshine, at last. Another village that stands out is Church Westcote with outstanding views from its slightly elevated position. Sadly, these villages continued the trend of not showing any signs of life. The only place that was busy was the organic farm shop, Bamfords, at Daylesford. 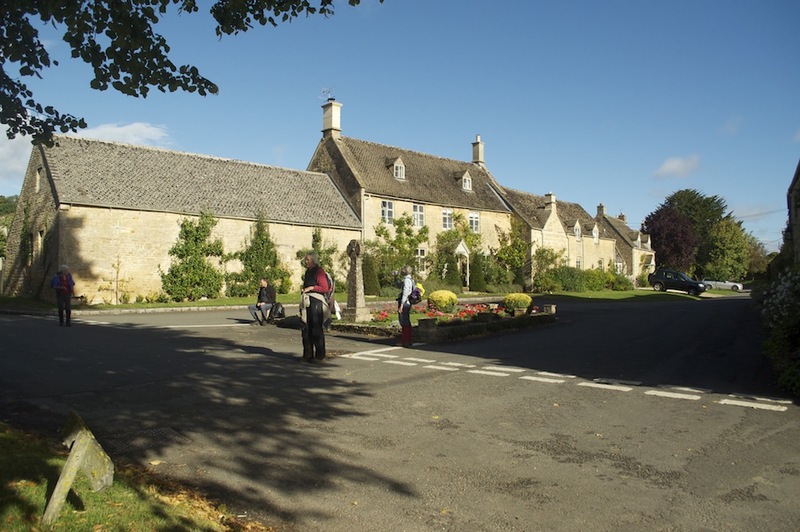 Another pretty village is Adlestrop made famous by poet Edward Thomas. 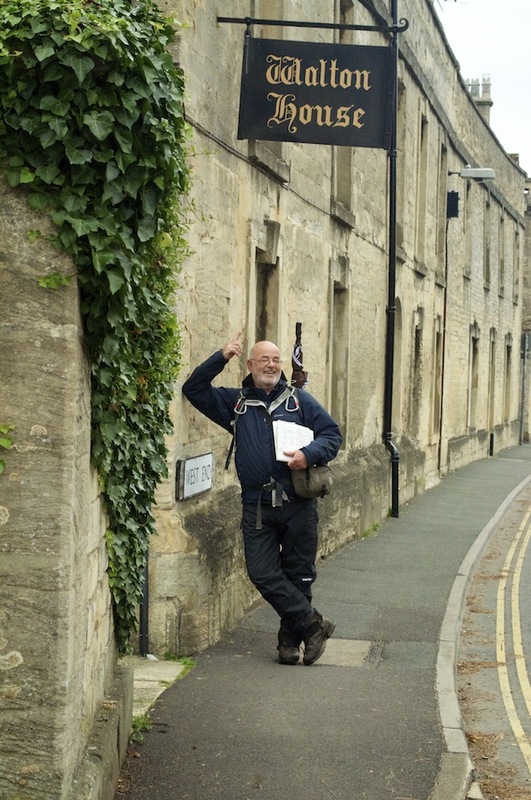 Soon our journey came to an end and after a little over nine hours after we started in the morning we walked into Moreton-in-the-Marsh and completed the Cotswold Diamond Way. 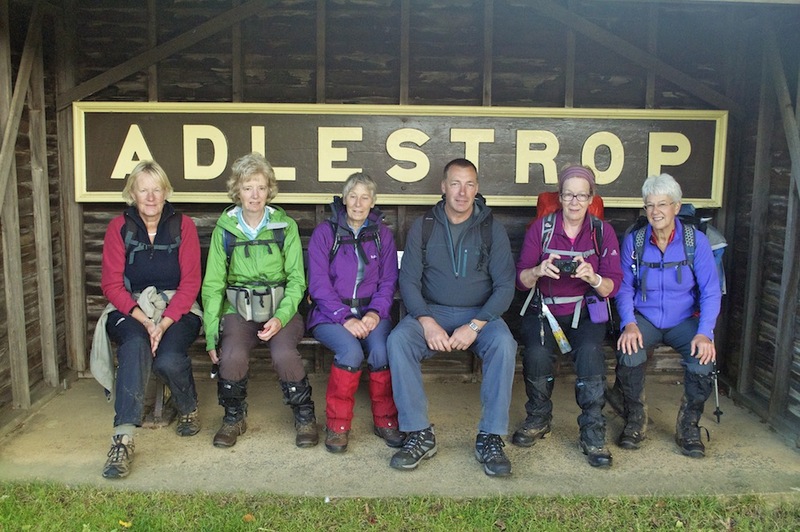 It was a brilliant walk in not so brilliant weather and although one or two found the length of days and the weather quite hard, an enjoyable time was had by all. 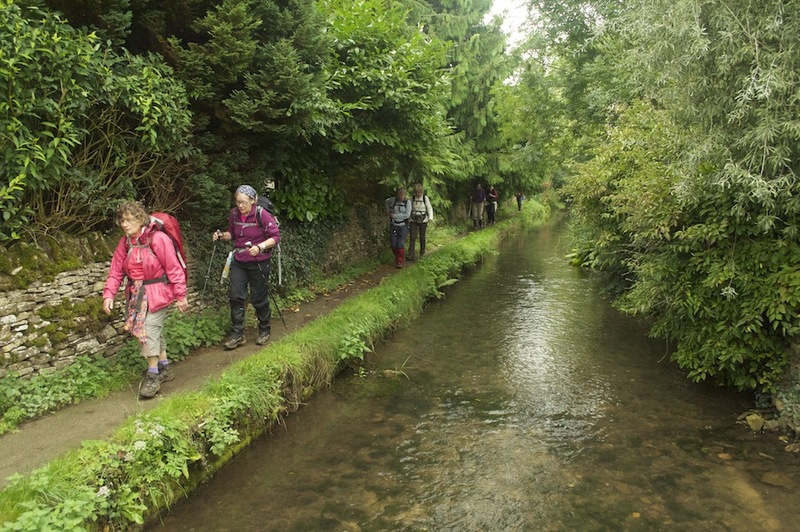 We had seen a part of England criss-crossed with numerous long distance paths – The Cotswold Way, The Gloucestershire Way, The Wardens Way, The Gustav Holst Way, The Archeology Way, The Heart of England Way, The Windrush Way to name but a few. The route is not always easy to follow as the way marks are not consistent or regular for long stretches of the route. I was very grateful that I had done the route earlier in the year so was familiar enough with it to not go wrong too often. What next? Probably Hadrian’s Wall next year. This entry was posted in Cotswold Diamond Way by jwalton. Bookmark the permalink.